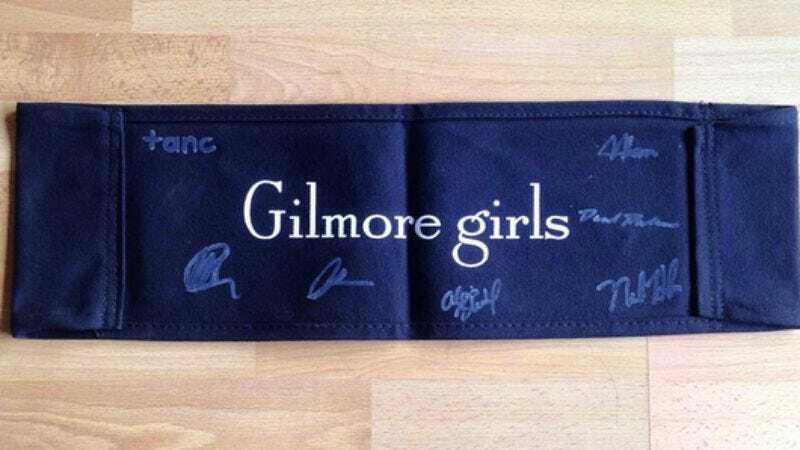 Starting on Thursday, Gilmore Girls fans will get a chance to bid on items from the upcoming Netflix revival and support a worthwhile charity in the process. Tanc Sade—who plays Logan Huntzberger’s douche-y Australian friend/fellow Life and Death Brigade member Finn—has teamed up with eBay for Charity to auction off items from both the revival and the original run of the show. All proceeds from the auction will go to the Karam Foundation, which delivers aid to Syrian families and provides educational opportunities for Syrian refugee youth. The auction starts at 9 p.m. EST on November 24 and runs through December 4. Sade has been documenting some of the items in the auction on his Instagram. They include a menu from Luke’s Diner signed by the cast and creators, his personal Gilmore Girls beanie, a copy of the shooting script for the season five finale “A House Is Not A Home,” and a backing from one of the cast chairs used on set of the revival. Bidding will take place on the eBay for Charity site starting on Thursday. You can also make a donation to the Karam Foundation without bidding in the auction right here.